Recorded in 1965 at Gene and Sara Estribou's home, the former Spreckels Mansion at 737 Buena Vista Avenue, San Francisco. This magnificent house was built for sugar baron Richard Spreckels in 1887. Jack London and Ambrose Bierce both lived and wrote here, while more recent residents included musician Graham Nash and actor Danny Glover. The boxy, putty-color Victorian—today a private home—is in mint condition. Gene Estribou was an early producer for the Grateful Dead, producing the single Stealin' in 1966 for Scorpio Records. Gene and J.P. converted the top floor ballroom of the Spreckels Mansion into a recording studio, where Intensifications was recorded. Gene plays songs he wrote for guitar on one side of the album, and J.P. plays songs he composed for banjo on the other side. 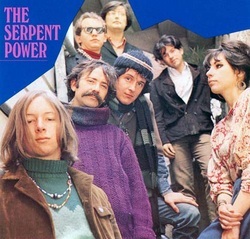 In 2007, The Serpent Power was named number 28 of 40 Essential Albums of 1967 by Rolling Stone Magazine in a special Summer of Love issue (honoring the 40th anniversary of the founding of the magazine) with a special mention of the song J.P. plays on, "Endless Tunnel." David Meltzer wrote recently of playing at The Coffee Gallery in San Francisco in the early 1960's with J.P. and James Gurley: "Jim, JP, & I wd improvise at The Coffee Gallery on Monday, hootenanny night. We were playing very outside avant stuff & people wanting the Kingston Trio wd either leave or drink more to somehow get adjusted to our joy."